It was an Iranian-born architect named Nader Khalili who has popularized the notion of building permanent structures with bags filled with earthen materials. Actually his first concept was to fill the bags with moon dust! 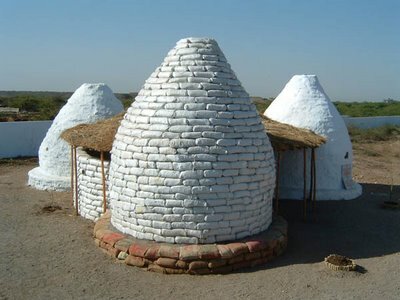 Attending a 1984 NASA symposium for brainstorming ways to build shelters on the moon, Khalili coupled the old sandbag idea with the ancient adobe dome and arch construction methods from his homeland in the Middle East. He realized that bags filled with lunar “dirt” could be stacked into domes or vaults to provide shelter. At first Khalili was filling his experimental bags with desert sand, but then he evolved his idea of “superadobe,” where bags or long tubes of polypropylene bag material would be filled with a moistened adobe soil that would dry into large adobe blocks. In this case the original bag material was merely the initial form and would not necessarily be an integral part of the eventual structure. Soon after these first experiments, Khalili began publicizing his work through newspaper and magazine articles and conducting workshops and seminars on the techniques that he was perfecting. Many people who read about his work, visited his compound in Hesperia, California, or studied with him there, decided to go ahead with their own experiments with his ideas. Among these “early adopters” were Joe Kennedy, Paulina Wojciechowska, Kaki Hunter and Doni Kiffmeyer, Akio Inoue, and Kelly Hart. I believe that it was Joe Kennedy who coined the more general term “earthbag” to suggest that the bag could contain a variety of earthen materials. Paulina Wojciechowska was the first to write an entire book on the topic of earthbag building: Building with Earth: A Guide to Flexible-Form Earthbag Construction was published in 2001. This featured some of her early experiments done at Khalili’s CalEarth, along with several other case histories. Kaki Hunter and Doni Kiffmeyer (a couple) became enamored with earthbag construction after studying with Khalili, and worked on a variety of projects, both for themselves and for clients. In 2004 they wrote and got published another book, Earthbag Building: the Tools, Tricks and Techniques, based on their particular experience. 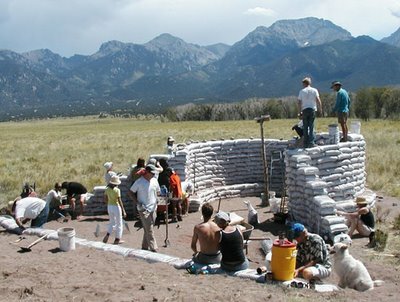 Kelly Hart (the author of this article) first began experimenting with earthbag building in 1997, after being exposed to the concept while producing his video program, A Sampler of Alternative Homes: Approaching Sustainable Architecture. 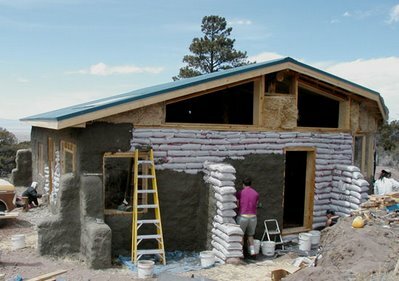 He later documented his experience in actually building his own home in another program titled Building with Bags: How We Made Our Experimental Earthbag/Papercrete Home. Both of these programs are now available as DVD’s. 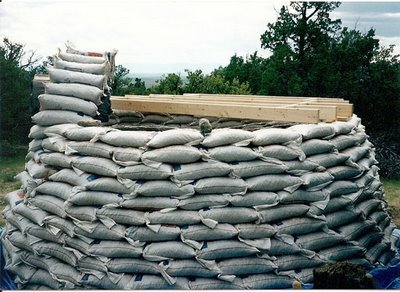 In the meantime, Nader Khalili was continuing the promotion of his “Superadobe” technique and eventually decided to patent the idea, which he obtained in the U. S. in 1999, using very general terms that cover using bags made of any material being filled with virtually any material, and combining these with barbed wired between the courses. While having made many public statements that this concept was his gift to humanity, he obviously wanted to capitalize on the potential economic reward. Many of us who had been engaged in promoting earthbag building on our own were contacted by Khalili and asked to enter into contracts with him in order to continue our work. It didn’t take much research to discover that his patent could easily be disqualified because he had been publicizing his techniques through various media for at least four years before he even applied for his patent. Patent law clearly states that such publicity occurring prior to one year before the patent application would disqualify it for consideration. Safety is of prime concern with all building technologies, and much experimentation and testing has been done to establish guidelines for many ways of building. Khalili has established a relationship with the building department in Hesperia, California where CalEarth is located, an area where earthquakes are naturally a great danger. In 1993 live-load tests to simulate seismic, snow and wind loads were performed on a number of domed earthbag structures at CalEarth and these exceeded code requirements by 200%. In 1995 dynamic and static load tests were performed on several prototypes for a planned Hesperia Museum and Nature Center to be constructed using Khalili’s Superadobe concepts with both dome and vault shapes. All of these tests exceeded ICBO and City of Hesperia requirements. But many of us have also built substantial homes using earthbags, and in the process realized how truly versatile and sustainable the technique is. 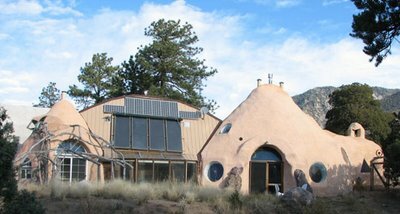 I wouldn’t be surprised if many of these earthbag homes are still standing long after their conventional counterparts built contemporaneously have disintegrated. Hi i am a studyind Architectural Technology at University, and i am writing my dissertation on sustainable architecture. This site is a great help to me, id just like to say thankyou. I am currently studing interior design and i am having a debate on monday about Sustainable architecture is just a trend, i have to debate that it isn't just a trend could i have your views on the topic? Sustainable architecture is the only trend possible toward a healthy future, by definition; the alternative leads toward declining vitality for both mankind and the entire planet. I agree that it is the only way to secure our future on this earth but do you think it is just a fad that people will get over and ignore in time? I don't think that green building is just a fad. I think that people will be paying more attention to this all the time, if for no other reason than it will save them money. how can you say such wonderful things about Dr. Khalili, and then slander his integrity at the same time? Khalili was a man of love and compassion, working for the good of all mankind. All of the profits from any cal-earth products or of his books, went directly back into the foundation since he started it. That money goes to keeping the school alive, and to further development of the technology, including getting fully permitted structures in California, which has made it much easier to build in many jurisdictions. I'm not sure what your interaction with him was like, but from my experience, he only asked that those who profited from the techniques would give a little back to promote the cause. Also, to suggest that Khalili and his students have not experimented with other materials, is just not true. I'd like to suggest that you revisit some of your research, and perhaps edit your article. there is no need for harsh words, and in his passing, i think it would just be common respect not to trash talk the man. you cannot deny his gifts to humanity, nor the profound impact he had on so many people in this world. Nader Khalili was a complex individual, as I am sure anyone who is familiar with him would attest to. I do not deny the huge benefit that he has provided humanity, and I believe that I granted him this in the article. I do stick by what I have written; there is nothing untrue or slandering in this article. It is certainly not my intention to "trash talk" him...only to reveal some of the complexity that makes him supremely human. In my more recent article written after Khalili's death, I wrote, "With the passing of Nader Khalili we have come to a point where his ideas and work can truly become universal. All of us who explore the potential of the earthbag concept and expand on its possibilities can help further his vision for bettering the world. We owe a great debt to this truly inspired individual. May he rest in peace!" Thanks for the great info on your site. It's superb! I wanted to know if you have heard of any building with just earthbag posts as structural supporting members. Would it be similar to say, a cinder-block post as far as strength? A single column of earthbags is not nearly as stable as a similar column of concrete blocks would be; earthbags need to be braced by adjacent earthbags to really be stable. Great article! I am in the process of designing an sustainable off the grid home using earthbags, concrete block, and steel. The home will be 2800 sq and totally self sustaining. After countless hours of research on CEB, Pisa, adobe, straw bale, etc.. The earthbag came out ahead in ever category. This a great resource right beneath or feet! I have some land in central washington and plan on building earth-bermed home. I do not want to use concrete. So far my thoughts - earthbag construction. Want to put living roof - is that possible? For these walls to support rather heavy green roof? I am already very interested about earth bags in building houses. I want to build a home made of earth bags in the Philippines. I hope it would be the answer to our hot weather. can these buildings be constructed and maintained in cold climates? I live in Canada, and I'm just wondering if it's a viable option here or if it's for a less fluctuating and extreme climate. While uninsulated earthbag domes can be very comfortable in moderate climates, some form of insulation is needed in more extreme climates. You can actually fill the bags with insulating material, such as crushed light-weight volcanic stone, perlite, or rice hulls. Or the walls can be insulated on the outside with other materials like styrofoam in bags or commercial foam insulation. This inexpensive way of constructing houses should be introduced in poor countries where people are in need of mass shelters.